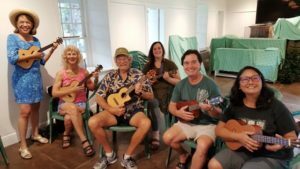 Five people came to the December 16 Ukulele Strumming Workshop at the Bailey House in Wailuku. Five people attended my 44th ‘Ukulele Strumming Workshop on Saturday, December 16 at the Bailey House in Wailuku bringing the total to 631 served since the workshops began on July 14, 2012. One couple came from Arizona; one couple came from Oregon; and one local resident – were all first timers to learning the Ukulele Mele Way. During the introductions, we found out that one of the ladies was a niece of a long-time student of mine at Kaunoa Senior Center where I have been teaching ukulele classes since 2009. Such a small world! There was a lot of excitement as everyone could play the ukulele. Thus, I knew we could play songs with more chords. After teaching an introduction to my method of forming chords with minimal muscle strain and strumming two songs with the basic Chalang-alang Strum, we expanded to more complicated strums and chords. We played a rousing rendition of Jingle Bells with the Hum Ding-Ah Strum and off-base chord of D7 with a verse in Hawaiian. Fun! Jingle Bells – 4-chords with Hum Ding-Ah Strum. Plus, I gave a history of the ukulele and demonstrated how playing other strums to the same song affects the mood of what you want to express. In other words, there is more than one way to play a song and you are in the driver’s seat to convey the feeling by the way you play the rhythm. “I love playing Hawaii Aloha,” commented one workshop participant visiting from the mainland. Nostalgic Hawaiian Songs, Vol. 2 packaged set of book/DVD/CD with 6 songs and 8 different strums. See other ways of learning ukulele from me from wherever you live. Register now for the next Ukulele Strumming Workshop on Saturday, January 20, 2018 at 10 a.m. at the Bailey House in Wailuku.